Once again I experienced the mellow core of the Jeff Rowland sound. This time, it was in the room he shared with Joseph Audio and Cardas Audio, where the big news was the premiere of the Joseph Audio Perspective2 Graphene speaker ($14,999/pair). When I entered, a track from a recording I know very well, Rosa Passos and Ron Carter’s Entre Amigos, was sounding far more mellow and toned down than on my system. This setup also brought out the mellow core of a sweet violin in the Bruch Scottish Fantasy. 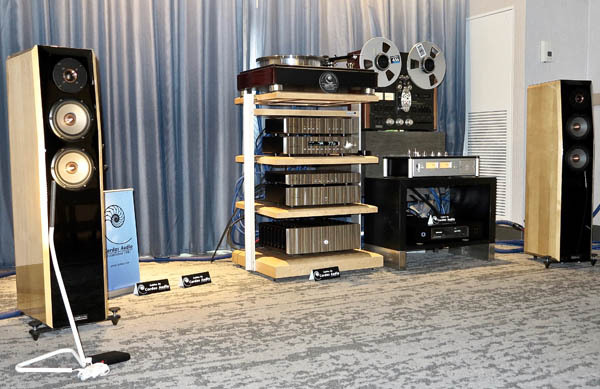 Either seen or heard: Jeff Rowland Design Group Conductor Phono Preamp ($8500 base price), Corus Preamp ($14,900), Aeris DAC ($9800), PSU Power Supply Unit ($8200), and 625 S2 Power Amp ($15,900); VPI HW40 turntable with Fatboy tonearm ($15,000) and Audio Technica ART 1000 Cartridge ($5000); Aurender A10 network music server ($5499) playing files and streaming Qobuz; and a Cardas Audio Nautilus power strip ($1500) and Cardas Clear and Clear Beyond cabling.